Choose Build a team from scratch. To limit content and conversation to a specific set of people, choose Private. For a community or topic that anyone in the organization can join, choose Public. If you're a global admin, you’ll see an option to create an Org-wide team. These are great for situations when you want to automatically add all users in your organization. From there, you can name your team, add a description, and edit the team's data classification. Once you've done that, you can invite people, groups, or even entire contact groups (formerly known as "distribution lists") to join your team. Feel free to create more teams—you can have up to 250 teams per account. Your organization can restrict who can create teams. If you can't create a team or need to turn off team creation, check with your IT admin. If you're a global administrator, consider creating an org-wide team that automatically adds everyone in your organization. TapTeams at the bottom of the app, then Settings in the top right corner. This will bring you to the Manage teams page. Tap to create a new team. Name the team, add a description, and choose its privacy level and data classification. After that, you're ready to start adding members. 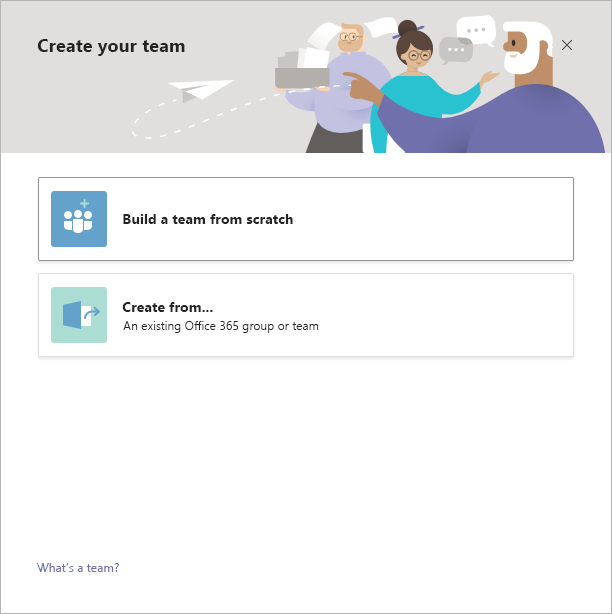 Invite people, groups, or even entire contact groups to join your new team.